Sample HTML5 project with source code. PHP with SQLite/MySQL backend. Patients can access a public calendar (weekly view) that displays available slots. They can request an appointment at the specified time (one of the free slots). Doctors can see all slots (free slots and appointments) with details about the patient. Managers can see an integrated view of all doctors and their appointments. They manage shifts and define the time slots. The calendar is switched to the week view using viewType property. The backend_events.free.php script return slots that were created in advance by the shift administrator. Only the free slots are loaded (status == "free"). The time slots were created in advance when planning the shifts using the manager's interface (manager.php; see below). 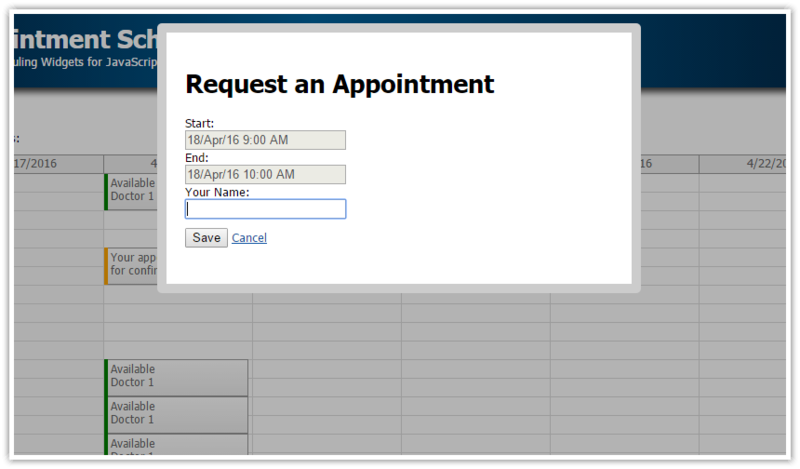 It opens a modal dialog ("appointment_request.php") where the patient can request an appointment. As soon as the appointment request is saved the slot status is changed to "waiting" and the color is changed to orange. In this demo, the user identification is saved using the session ID. In a standard application, you would use the user id instead. The doctors can use a special user interface to manage their appointments. They can see all slots (including free ones). The layout is similar to what the patients can see but the configuration is different. This edit page ("appointment_edit.php") allows changing the status and the patient name. It's possible to delete the appointment slot using "Delete" button. 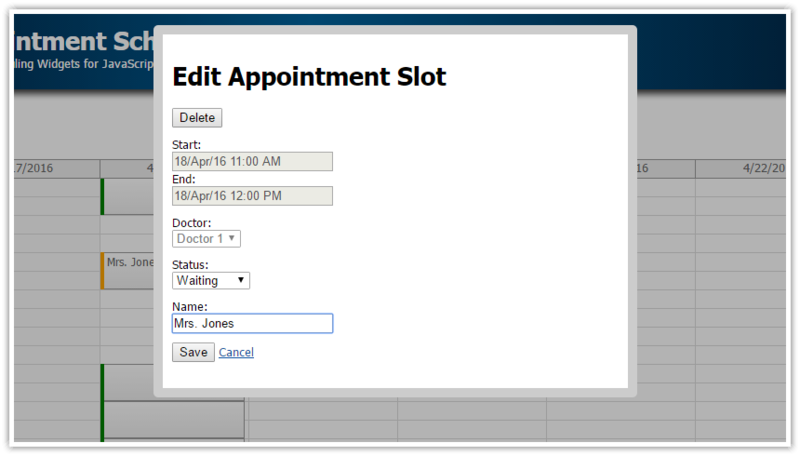 The tutorial uses a simple database with just two tables ('appointment', 'doctor'). The database is stored in daypilot.sqlite file in the application root directory. Make sure the application has permissions to write to the database file. You can use SQLiteStudio or a similar to view and edit the database. The script will create the database ('doctor' by default) automatically if it doesn't exist, create the required tables and add some sample data to the 'doctor' table. ASP.NET web application for managing doctor appointments. Includes public and management interface. SQL Server database. C# and VB.NET project versions.